So, George R. R. Martin and his helpers Elio M. Garcia Jr. and Linda Antonsson wrote a book called "The Untold History of Westeros and The Game Of Thrones." The book is an attempt to give serious fans a glimpse into the history of the Westeros from the beginning of its recorded history up to where the books begin. 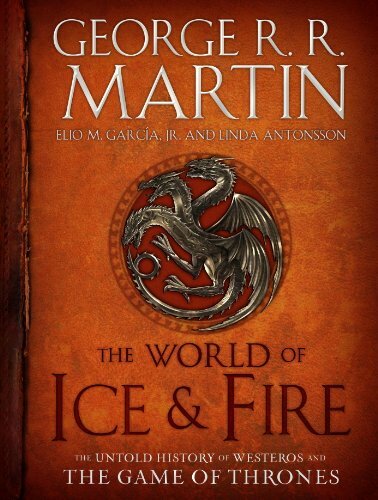 As with most of GRRM's ASOIAF writings The World of Ice and Fire is very dense and detailed writing and I have learned that taking it a chunk at a time is pretty helpful. So, that is what I am doing here, tackling each chapter of the book and seeing what insight I can share (if any). "The Dawn Age" Before "A Song Of Ice And Fire"
Giants, the Children of the Forest, Greenseers, Skinchangers, and Iron Islanders (with a few mentions of the first men). * Giants were apparently pretty boring (beyond their size...sorry Wun Wun), they didn't fashion tools, farm, make houses, wear or make clothing, or even make weapons. They were up to 14 feet tall, often lived over 100 years, and at times buried their dead. * The Children of the Forest can fashion obsidian tools and weapons (aka dragonglass aka "frozen Fire") hunt and farm, dress in clothes made of leaves and bark, and used Weirwood to make bows and snares. They also carved the faces in the Weirwood. The book mentions a theory that the practice of sending Ravens started with the Children of the Forest because the Children could speak directly to Ravens. * Greenseers were the rulers of the Children of the Forest and had a number of unique powers, they could speak (or communicate with) animals, they could use the Weirwood trees to see all over what became the 7 Kingdoms (the book leaves this as speculation but we know better). Greenseers can also see far into the past (we have seen this) and into the future (I do not think we have seen this per se). Apparently, the visions of the future Greenseers receive are unclear and often misleading. * Skinchangers did not exist during the "Dawn Age," they are included here just as a juxtaposition between the ability of Greenseers to communicate with animals and the ability of Skinchangers to inhabit the animals themselves. The World of Ice and Fire suggests that Skinchangers are "unnatural men" that inspire fear but this sounds more like an attempt to help us understand the roots of the prejudice against Skinchangers than it was about Skinchangers being inherently evil. It is suggested that Skinchangers come from beyond the wall (wildlings). * The book suggests but does not confirm, that there are rumors about the Iron Islanders being present in the 7 Kingdoms (apparently, the Seastone Chair dates to this time period). The main takeaway from all of this is that it confirms what we already suspected, Bran Stark is one of the only people in history to be both a Warg, a Skinchanger, and a Greenseer. We saw this play out spectacularly in the "Hodor" episode as Bran controlled Hodor in both the present and past at the same time he was Greenseeing. One of the most popular posts in the history of my blog explained this process. You can read that one HERE. One other interesting aside, we learned that there are still a few powers that Bran has not used yet. There is no way of knowing if he knows that he can also look forward in time and communicate (not just enter the mind) of animals, but apparently those things are possible for him. Well, that is the end of my first piece, hope that you enjoyed it! What did you find interesting in "The Dawn Age?" How do you see Bran's story playing out in the next season of Game of Thrones?